These dunk able Oreo cookies make a great gift for the chocolate lover in your life. 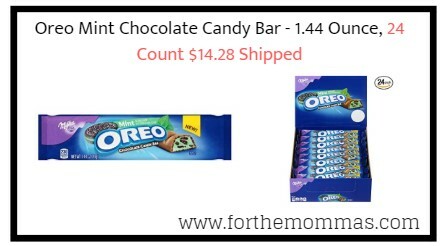 Amazon has Oreo Mint Chocolate Candy Bar – 1.44 Ounce, 24 Count for $14.28, with FREE Shipping on orders over $25.00 or with Amazon Prime Orders. These Oreo Cookies are enveloped in mint creme filling and rich chocolate candy.